His Mischief is a Minnesota rock band. 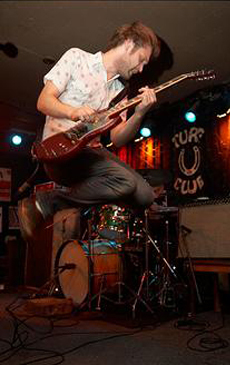 Lead singer & guitar player Sheridan Fox got his start in the local music scene with Effervescent. In 1999 they released a CDEP on Sabertooth records. Sheridan moved out east for college and started a new band, Model Down. They toured the US and put out a CDEP on Modern Radio in 2005. After college Sheridan returned to the Twin Cities and started His Mischief with good friends Jeff Brown and Jeff Quinn. Jeff Brown previously played in Saint Paul bands Grotto, Askeleton and the Hidden Chord, and Jeff Quinn played in Rockethouse. Jeff and Jeff have been in Sean Na Na, The Monarques, Baby Boys and are the occassional backing band for Har Mar Superstar. His Mischief toured the U.S. several times and played shows with bands including The Faint, Crystal Antlers, Birds of Avalon, Menomena, Ted Leo and the Pharmacists, Viva Voce, Har Mar Superstar and Monotonix.